You may remember that a significant portion of Q1 2016 was devoted to the search for a white statement blouse, which led, ultimately, to the purchase of three statement blouses. Follow these links if you need to re-fresh your memory: Ghost; Pirate; Flounce. For those of you who wondered how the most arresting of the statement blouses would fit into my daily life, wonder no longer! 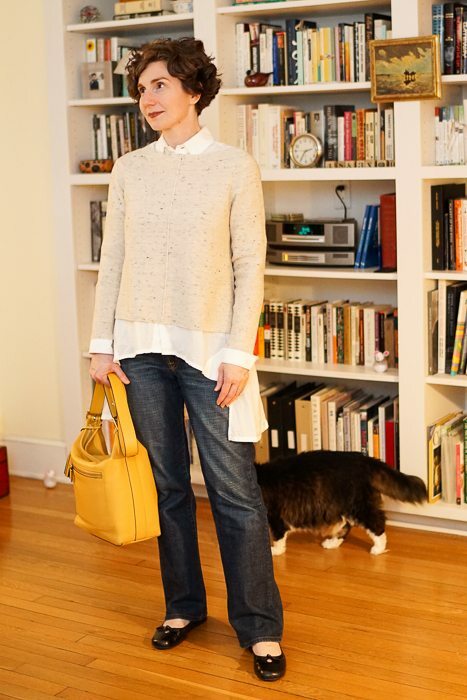 Here it is with my favorite jeans, my favorite black flats (which actually have a tiny wedge sole), and my favorite new sweater from Eileen Fisher. 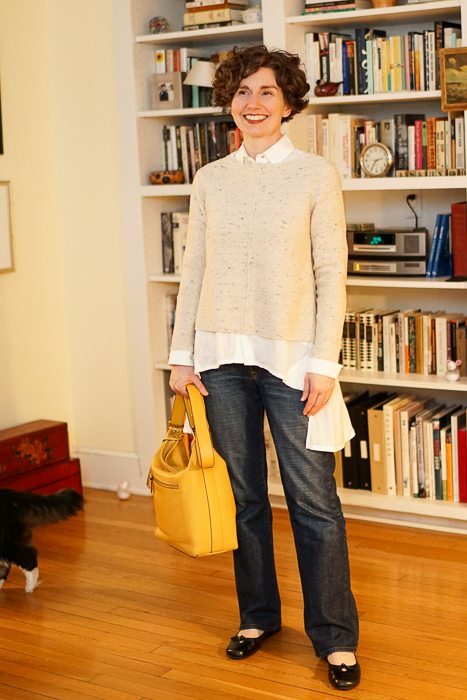 Does she mean favorite sweater, or favorite Eileen Fisher sweater? 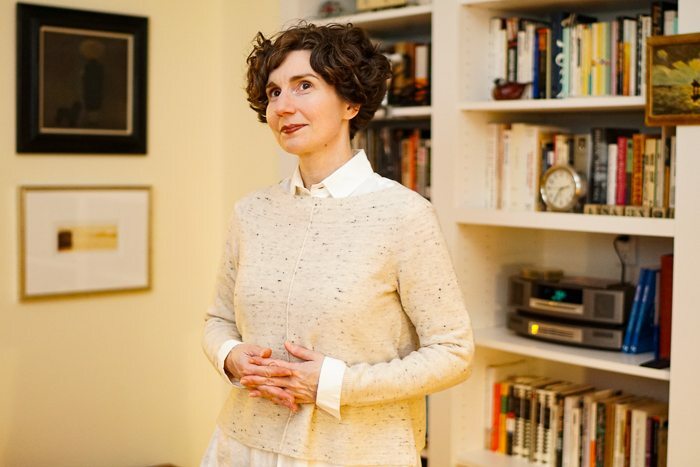 This blouse has a tidy collar, smart cuffs, and a sweeping back. The front and back are joined at the hem by white jersey gussets. It’s all quite dramatic, but nevertheless looks casual and cozy here. From behind, the drama is most apparent. Perhaps I look like an apparition as I walk down the halls of my office. An apparition that likes to bundle up. Note: The three vertical black stripes on the yoke — a Y-3 motif — are visible just above the neckline of the sweater. Do I look like a sweater-wearing ghost? I am a big fan of Eileen Fisher. I don’t love everything in the store, but the things that I do love, I love without reservation. Like this sweater, which I bought for myself and my mother for Christmas. Things to love: dark flecks in the yarn, center seam, short length. And there is one more thing that you cannot see and will have to rely on me to convey: Soft as a cloud. When I bought this blouse, I imagined that these smart cuffs would require particular attention in laundering — i.e., ironing — but that isn’t actually so. They look pretty good after laundering the blouse in hot water and hanging it to dry. Objectively, I like the color of this sweater, but I think it would make me look sallow if worn without anything underneath. 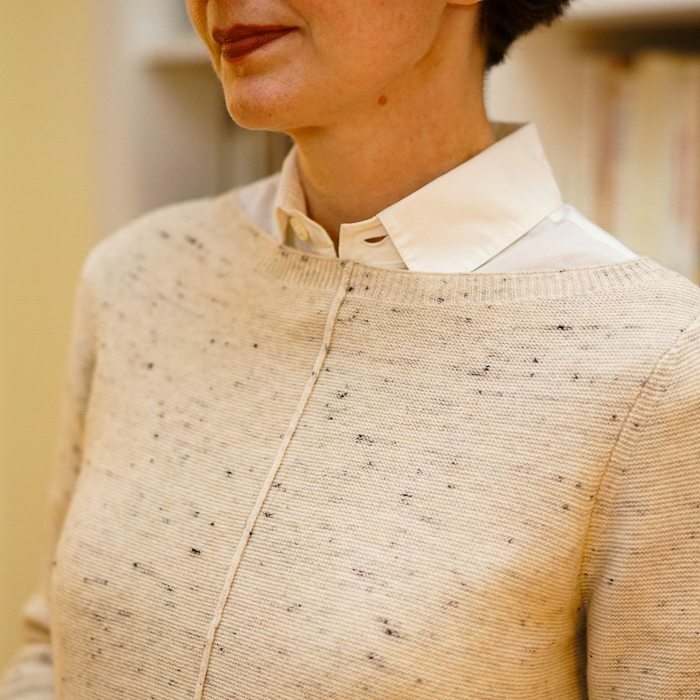 You may ask, Why, Directrice, would you buy a sweater that you think would make you look sallow? A fair question! 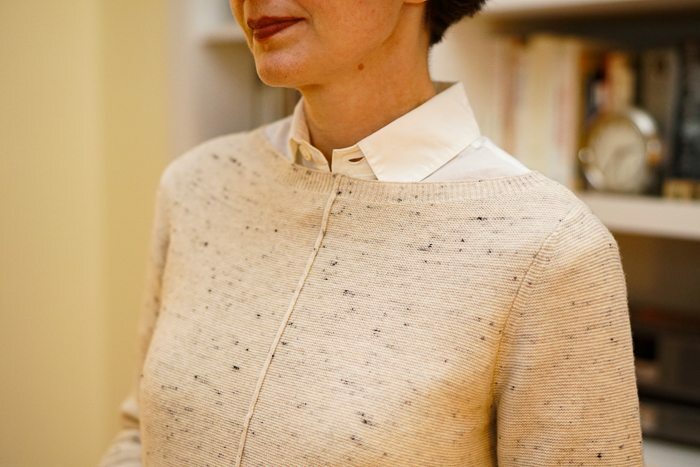 But I have a good answer: A white blouse provides a little contrast with the sweater and is just the thing to keep my complexion looking healthy. Do you see who has wandered into the frame? 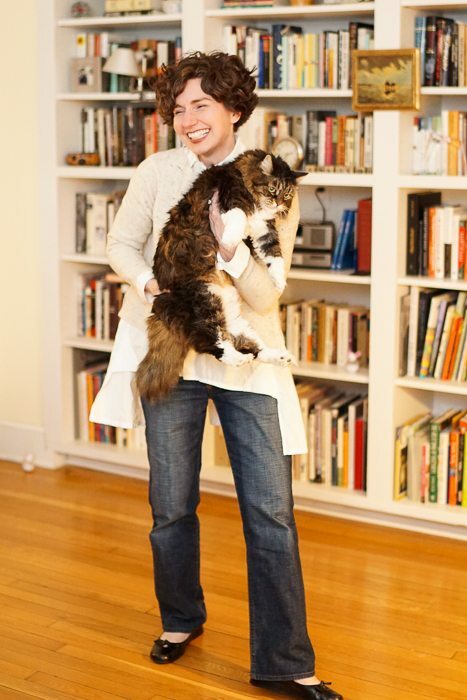 It’s Harper, house-cat and companion animal par excellence. She walked past me and then looped back around . . .
which seemed a clear signal that she desperately wanted to be picked up and photographed . . .
See? Look at how delighted she is! Have a fantastic weekend! I’ve been thinking about my New Year’s Resolution . . . I bought this blouse when you first featured it and I love it. I wear it all the time as you have, underneath a short sweater or with a blazer. The 3 black stripes in the back are a small but cool detail. Thanks for the inspiration back then. I think Harper is trying to point out that SHE is the inspiration for wearing something over a white underlayer! She has the original “white blouse”, albeit a fluffy one. What a great combo on you. I think you’ve done ecru and white in other incarnations? I need to try that myself. 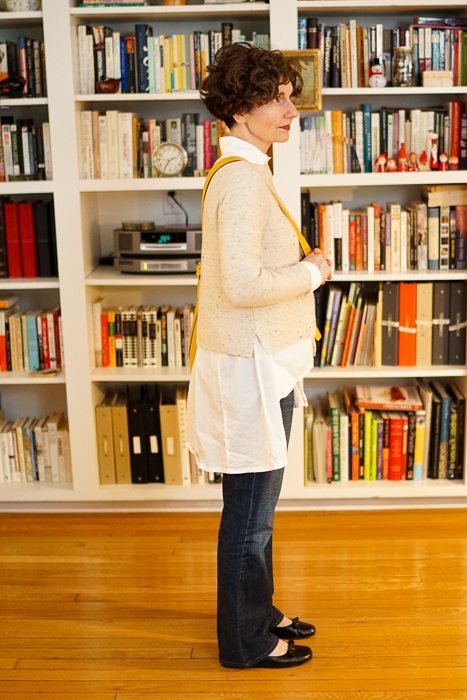 And I love Eileen Fisher — I’m definitely in the “soft pants” camp. The company also seems to be ethical and eco-conscious, which is nice. but that might just be my gullibility to marketing. You’re inspiring when it comes to statement blouses! “Look how delighted she is.” And Harper’s ok with it, too. Beautiful sweater I have a royal blue blouse that looks very pretty with it, brings out the subtle dark flecks of color in the weave. l also like it with a white blouse. great smile and a great cat! From the back it’s almost like the “dress over pants” style – which I still love. 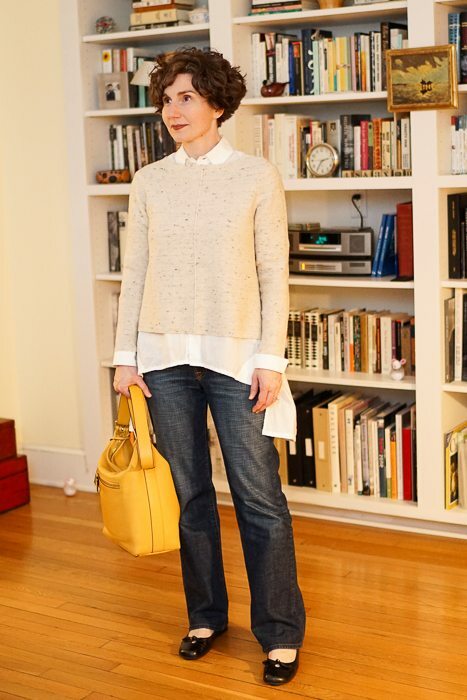 I am sure it wasn’t the easiest finding the perfect sweater cut for this blouse. This combination looks excellent. The sweater has just the required length and looseness to complement the blouse. Beautiful!